Liposuction Newport Beach | Boris M. Ackerman, M.D. The consultation with Dr. Ackerman is used to evaluate your physical needs and determine if you are a good candidate for treatment. Liposuction should not be performed as a standalone procedure on those who have skin laxity from aging, pregnancy, or weight loss. 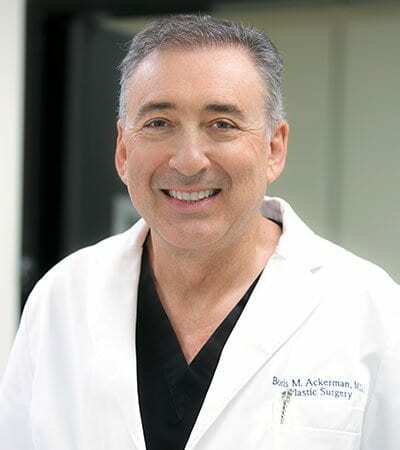 During your consultation, Dr. Ackerman ensures you are healthy enough for surgery. You can review our before and after photo gallery to develop a clearer understanding of your aesthetic goals. Dr. Ackerman performs liposuction on an outpatient basis. Usually the surgery is performed under twilight anesthesia. The time it takes to complete this procedure depends on the number of areas being treated and the amount of correction needed. There are a few different methods to perform liposuction. Dr. Ackerman prefers a tumescent method with a “power assisted” device. A tumescent solution is injected into the treatment areas to help break up the deposits of fat. Dr. Ackerman creates tiny incisions along the natural creases around the target location. A cannula (thin hollow tube) is inserted beneath the skin through the incisions. After moving the cannula around gently to separate fat cells from other tissues, a suction device permanently removes the fat. Dr. Ackerman carefully performs liposuction to ensure a speedy recovery for his patients. Bandages are initially placed over the incisions, and compression garments are worn to reduce swelling. Most patients can return to work after a couple of days, but they should avoid strenuous activities and exercises for at least two weeks to ensure a safe and proper recovery. Dr. Ackerman will provide you with individualized recovery instructions that specify when to change your bandages, when to shower, and the types of activities you can engage in. To schedule a liposuction consultation with our board-certified plastic surgeon Dr. Ackerman, call our office at 949.759.3284.